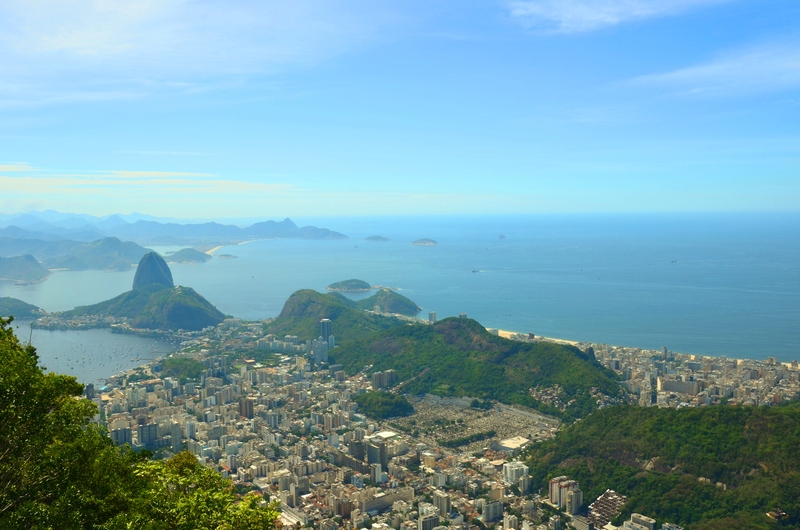 5 of The Best Tourist Attractions to see in Rio de Janeiro, Brazil – Why Waste Annual Leave? When I look at my parents’ travel photos back in the 70s, I see some beautiful pictures of my Mum smiling sweetly in front of the Colosseum in Rome. As I flick forward, I spot her standing proudly by the Eiffel Tower. I find these classic photos endearing and then I wonder why, somewhere along the way, it became unfashionable to go to major, well-known tourist attractions. Surely, there’s a reason famous sights are famous; a reason they have been celebrated for generations and a reason we should continue to nurture them, however much we foray into the unknown. 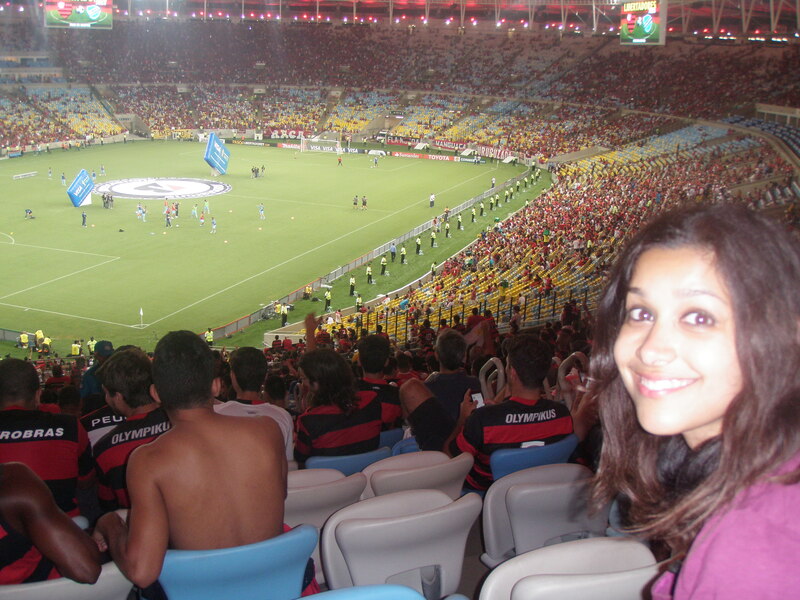 In this, my first trip to Rio, I did just that, celebrating all that it is famed for. There are few other world cities that fuse mountainous terrain, golden sandy beaches and urban high rises quite so harmoniously and that for me was the essence of what gives Rio such a flair. 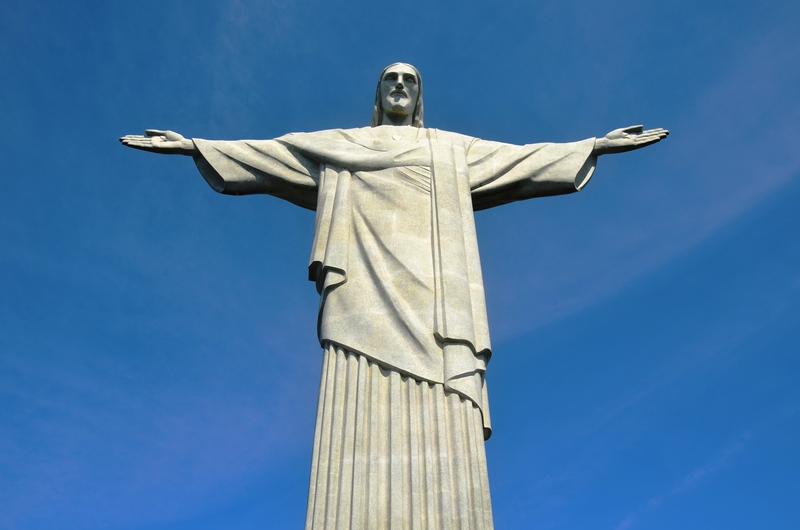 No visit to Rio would be complete without ascending the Corcovado to see the impressive Christ The Redeemer (Cristo Redentor), which just eight years ago was named one of the new seven wonders of the world. You don’t have to be Christian to feel a certain sense of spirituality, looming beneath this 38m high iconic work of art. We went without advanced booking and arrived at around 8.30am but still weren’t able to board a train until 9.20am. Come early – you snooze you lose. The right hand side of the train is the place to be to assure optimal views on the ascent but this inside “secret” is far from a secret and the only view I got on the way up was that of somebody’s derriere. 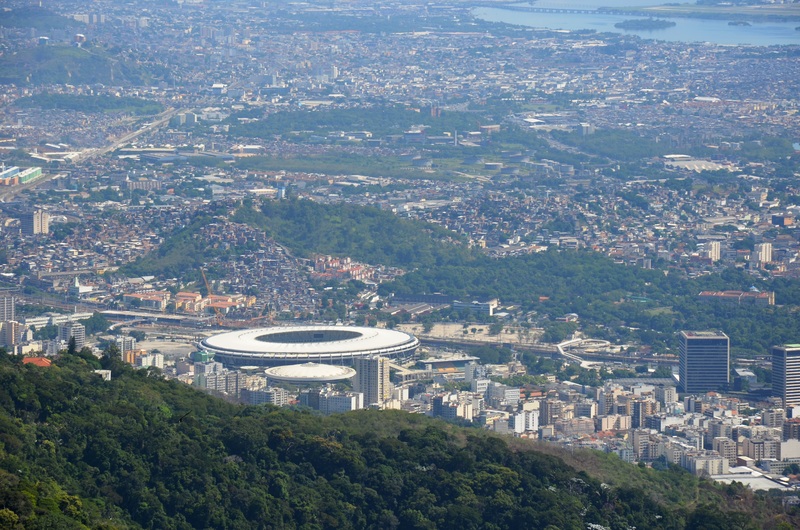 The view from the Corcovado offers so much more than just the statue with panoramas of Sugar Loaf Mountain, Copacabana and Ipanema beaches and the site that had Pumpkin’s heart fluttering chaotically – the Maracana football stadium. Try to aim for a clear day –clouds dampen the views as much as they do the atmosphere so if you can tolerate queues, it is worth skipping advanced booking and playing it by ear depending on weather. To get better photos, encompassing the entirety of this 1145 tonne statue, be prepared to get down and dirty – literally. We were far from the only tourists seen lying on the floor, cameras pointing towards the heavens but dress more wisely than I did – white dresses are not fit for this purpose! I prefer the Brazilian name, Pao de Acucar – meaning “bread of sugar” which is surely every bit as sweet linguistically as it would be on the palate. 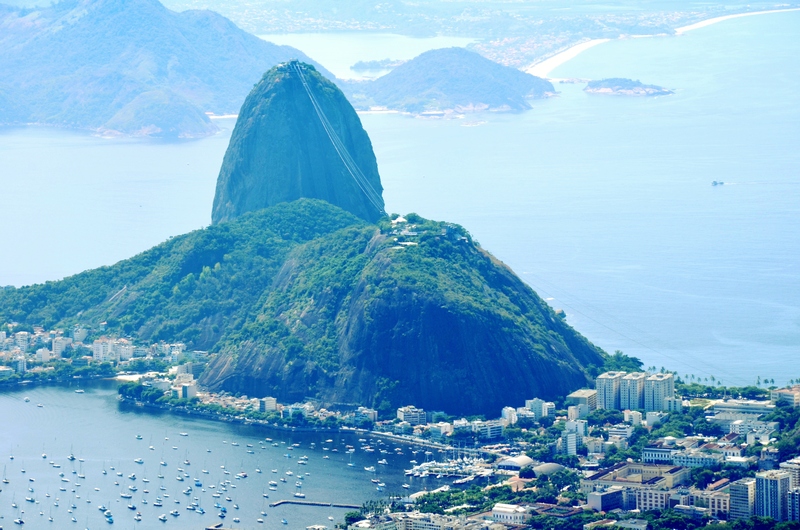 This beautiful round-topped mountain is one of Rio’s most famed sights. 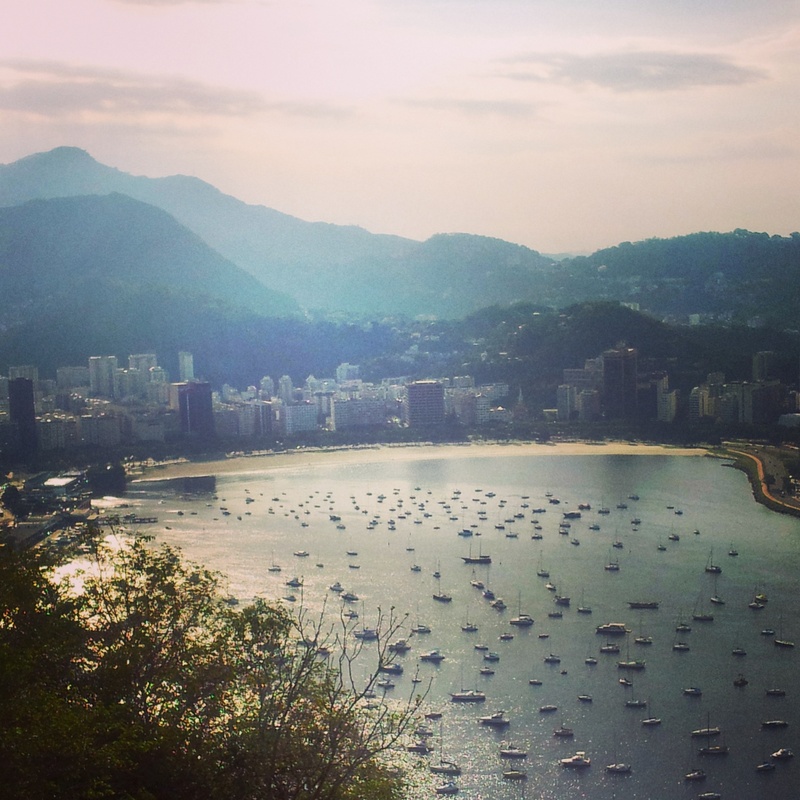 We took a cable car to reach the top of Sugarloaf Mountain, trying to time it for dusk and the views certainly did not disappoint, particularly watching the boats scattered like marbles on the golden-rimmed. reflective waters. 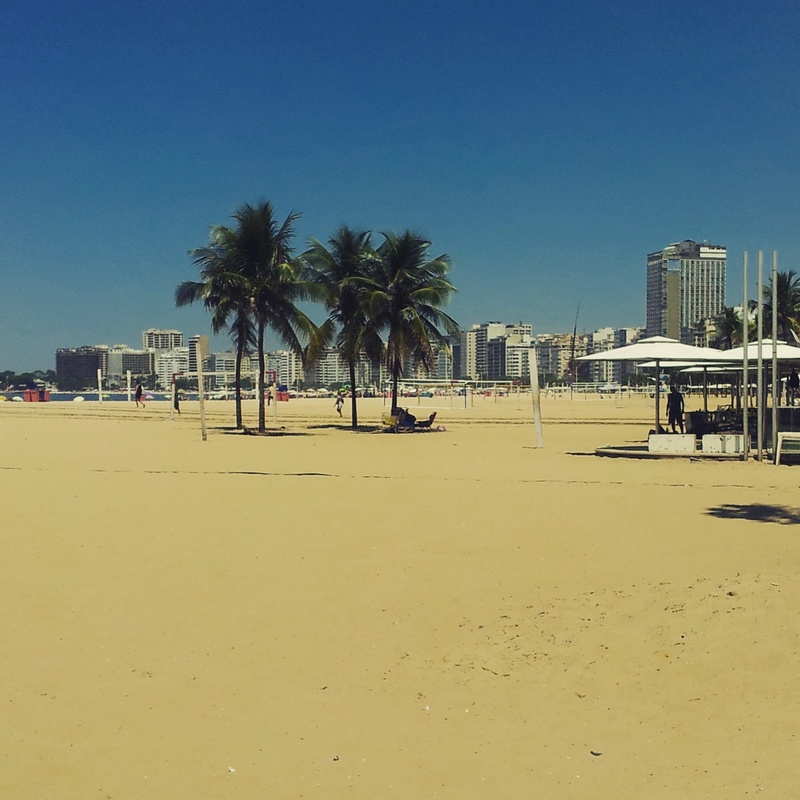 Love it or hate it, a stroll along the Copacabana is the only way to find out for yourself what you make of this stretch of beach that distinctly divides opinion and is adjacent to a wide promenade that houses countless high-rise hotels, including the famous Copacabana Palace. We stayed at the fabulous Porto Bay Rio right on the Copacabana, giving us plenty of opportunities to find our feet here. The faded-yellow sand is luxuriously easy on the feet. Once the place to be seen and a favourite amongst celebrities, it is clear to see that those days have passed. I won’t lie – it took me a while to warm to Copacabana but what I found appealing about it was this: this is a beach that belongs to the people, especially after sunset. The shores are buzzing with the sounds of young boys playing football, bootcamp victims doing circuits on the sand and couples, embraced in passionate kisses, while the Atlantic Ocean roars ferociously. Lines of street food carts provide the fuel for the sport, although I had a guilty intuition that it was, in reality, more the tourists than the locals indulging in the Churros. 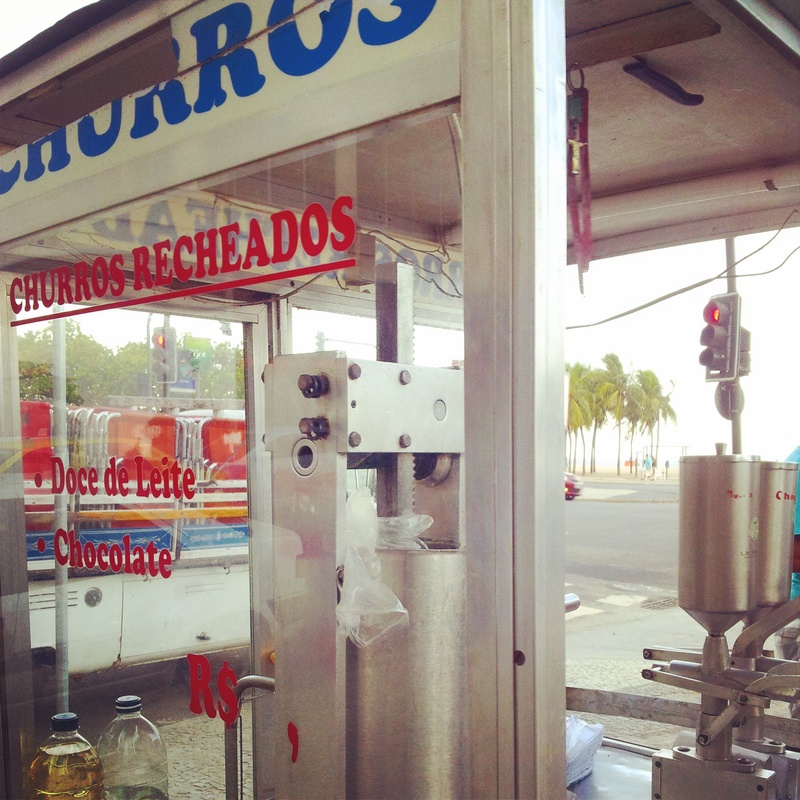 A stream of kiosks form the boundary between the promenade and the sand, with the sounds of Brazilian samba blaring from the speakers and serving far better food than one might expect from a beach-side kiosk. Of course there are tourists milling around but I got the distinct impression that it wasn’t really about them. On the powdery floors of the Copacabana, we were almost an afterthought, a phenomenon I found oddly refreshing. As Barry Manilow so aptly sang in his annoyingly catchy 70s classic, “music and passion were always in fashion at the Copacabana”. I’ll admit that watching a game of football on the last night of what had been an epic holiday wasn’t exactly my idea of a romantic evening. But, as Pumpkin patiently navigated me through all my chosen gelaterias in Buenos Aires, I couldn’t deny the look of glee in his face that came with watching a match at the world-famous Maracana. You can make your own way to the stadium or numerous agencies arrange ticket purchase, hotel transfer and accompany you to the entrance. 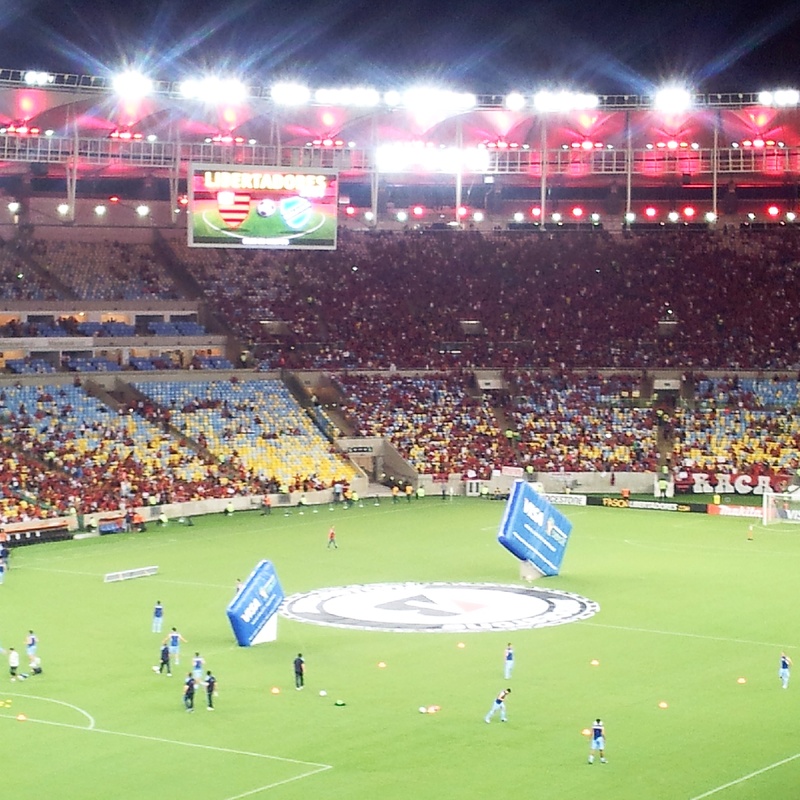 We were watching Flamengo v Bolivar, Flamengo being Brazil’s most loved and famed team. We knew we were nearing the venue when we saw street upon street illuminated by red and black stripes, cavorting in swarms, chanting, drinking beer and feeling optimistic. Sadly, the feeling of euphoria was a forgotten story by the end of the night when a 2-2 draw left moods subdued. There is a real sense of solidarity amongst supporters here and they were more than happy to get us involved in the jubilation when Flamengo scored their first goal. The brainchild of the late Chilean artist, Jorge Selaron, I never imagined I would be so inspired by a staircase but this mosaic tapestry of striking colours and vibrant, visual stimuli harnesses hour upon hour of artistic ambition and vision and pays tribute to a man whose soul lies in each tile. In 1990, Selaron started renovating this staircase and with each tile, from emerald-green to canary yellow, radiant blue to the shiny mirrors, his passion to the cause became further embedded. Used on set for some famous music videos including this one with Pharell and Snoop Dog, it seemed fitting and poignant that Selaron took his last breaths in the place that earned him such personal and critical acclaim. Sadly, the maintenance of the staircase since his death has declined and there is a deep sense of concern amongst those who love it about the perceived lack of effort being put into this. And as a final afterthought – a taste more than a sight! The drink that is to Brazil what Sangria is to Spain. 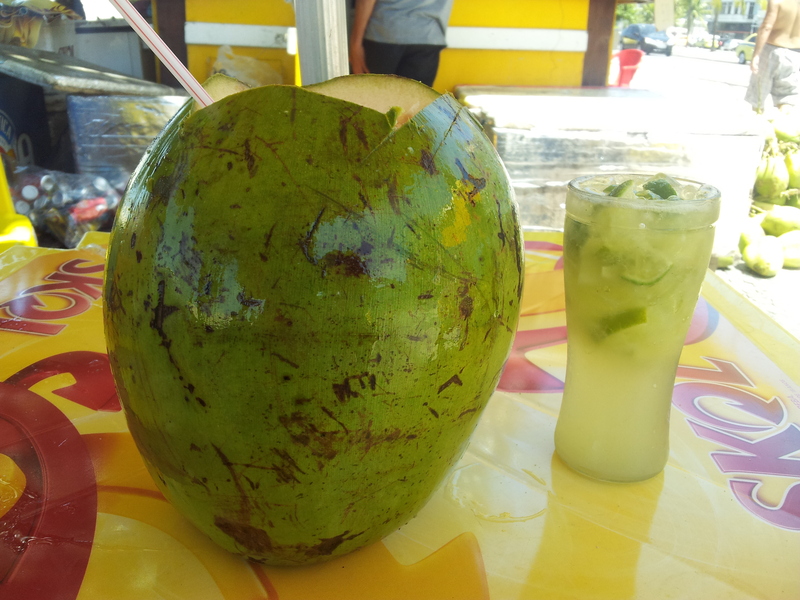 As the national cocktail and a favourite of turbo-powered mixologists all over the world, this is a drink you cannot miss in Rio, unless of course you’re teetotal like I am (hence the giant coconut that overshadows it.) Made of Cachaca, a sugar cane liquor, sugar and lime, this cocktail (I am reliably informed) is refreshing and zingy, perfect for a scorching day on the Copacabana. So that I wouldn’t be left with a terminal case of FOMO (fear of missing out), I did ensure I at least had a virgin Caipirinha and in the humid sun, the burst of lime stimulated my circulation and awoke the senses. 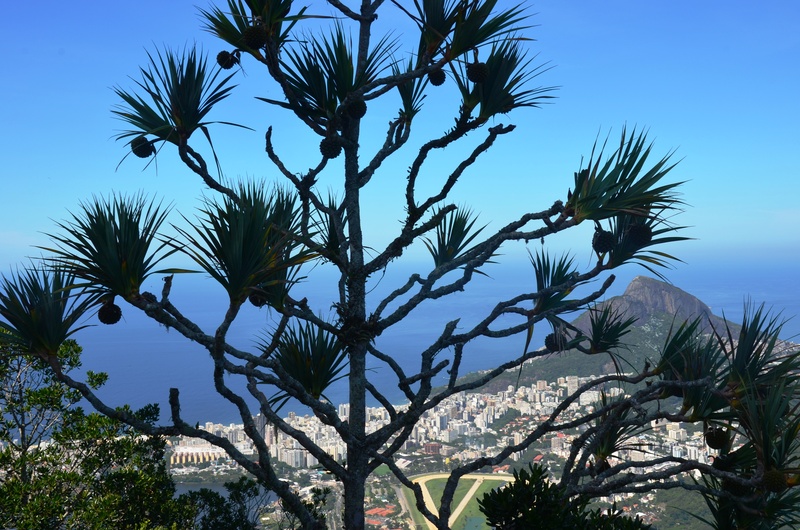 Have you been to Rio before? Which other sights would you recommend? 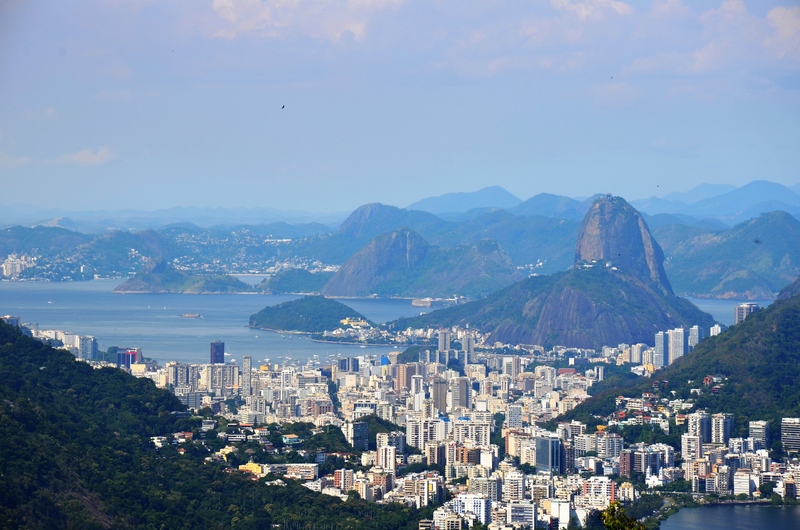 A great list of things to do in Rio. I have never been there but I had heard of most of the attractions – as you said, they became famous for a reason. However, I have never heard of the stairs before and I just love how colorful there are and how much effort went into creating them. It is a shame that they haven’t been maintained. Thanks Constance! 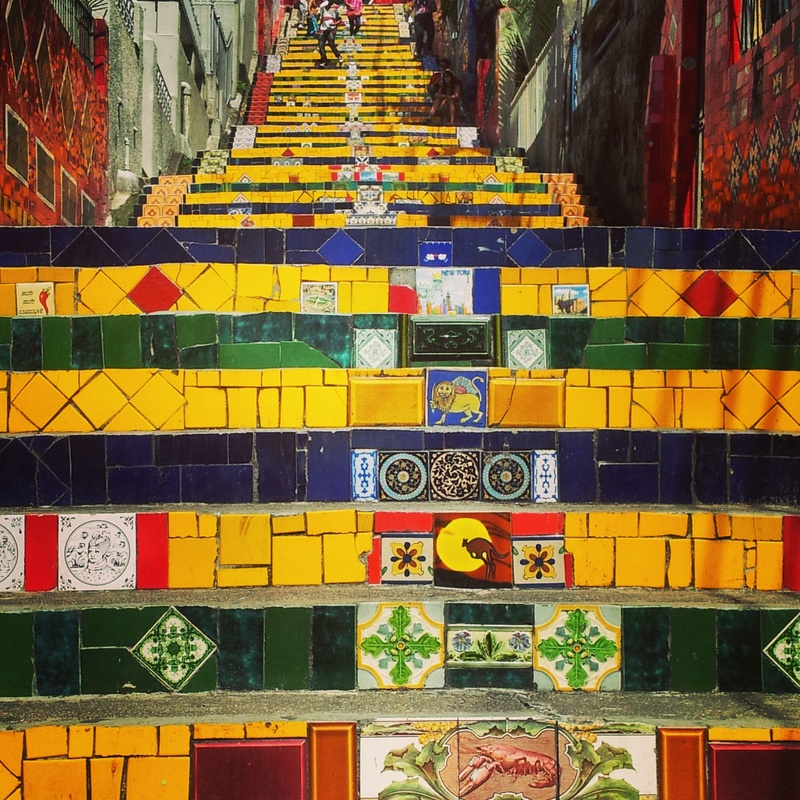 It was exactly the same with me – until we were heading to Rio, I knew nothing about these stairs even though I was aware of the other sights & the steps turned out to be a real highlight! I really hope the government will try and ensure it is looked after properly to pay homage to what a great job he did with these steps in his lifetime. They say when he was alive, he personally ensured it was being maintained properly. Ohhhhh I am dying to go to Rio!! This post is killing me!!! 😀 Next year!! I really hope you do make it there next year Tim and I’ll be eagerly awaiting your posts on it when you do. It’s a lovely city ☺ Thanks so much for reading! 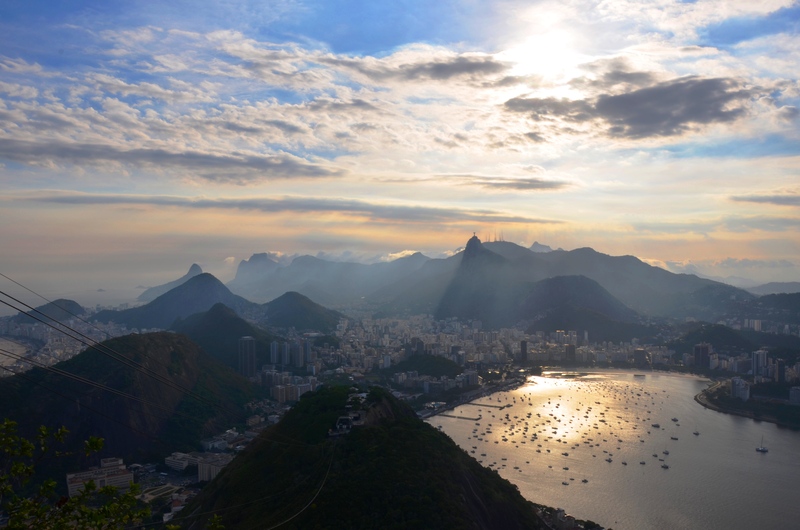 I’d love to head to Rio just for the views alone! And to eat street food near Copacabana, yum! How many days do you need there you think? I always wanted to make it there. 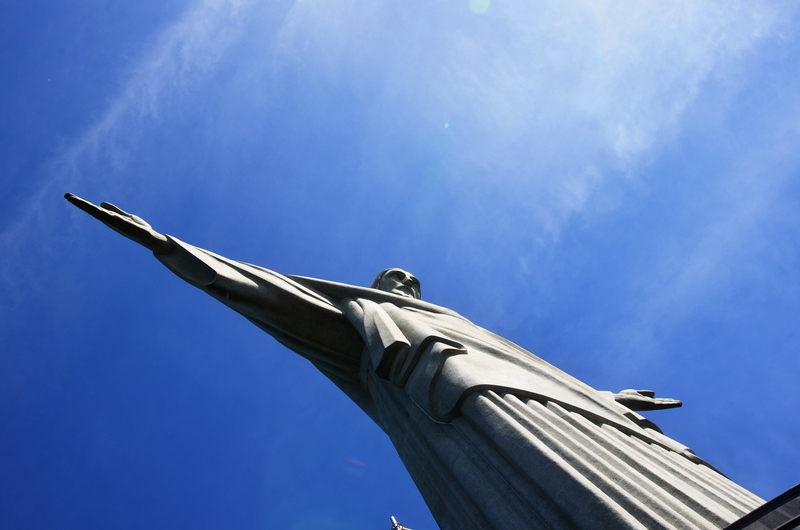 Corcovado – Christ The Redeemer Statue is on the top of my list!! I admit sometimes, I can’t stand the crowds at the tourist attractions, but you’re right.. they’re famous for a reason. The attractions in Rio look amazing! I really would like to go to Brazil when I make it back to South America. I’m not a football fan, but I bet it was fun to see a game, if only to be a part of the spirit! We were in Uruguay when the World Cup was going on, and I remember the energy was so incredible that it’s hard not to feel it too. 🙂 And what is the debate about Copacabana? Maybe I’m totally ignorant, but I don’t think I’ve heard anything bad about it! 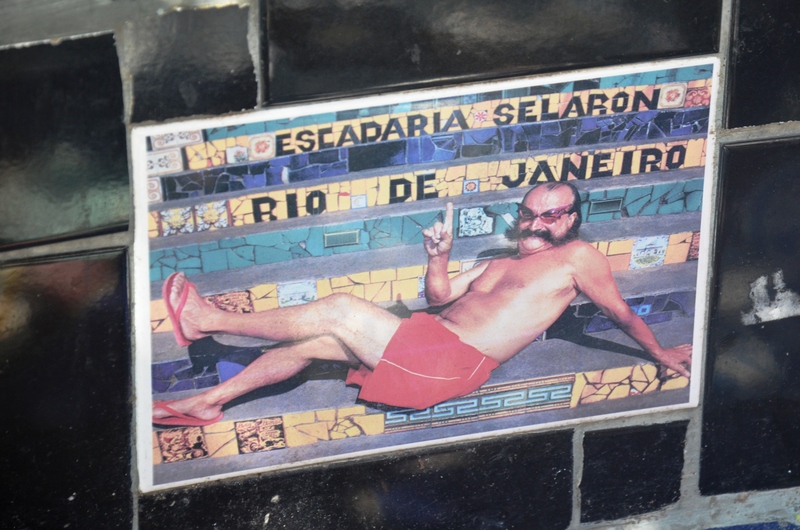 We loved Rio but we didn’t know about the Selaron steps! Will have to go back to check those out, I did see that music video so they do look very familiar! 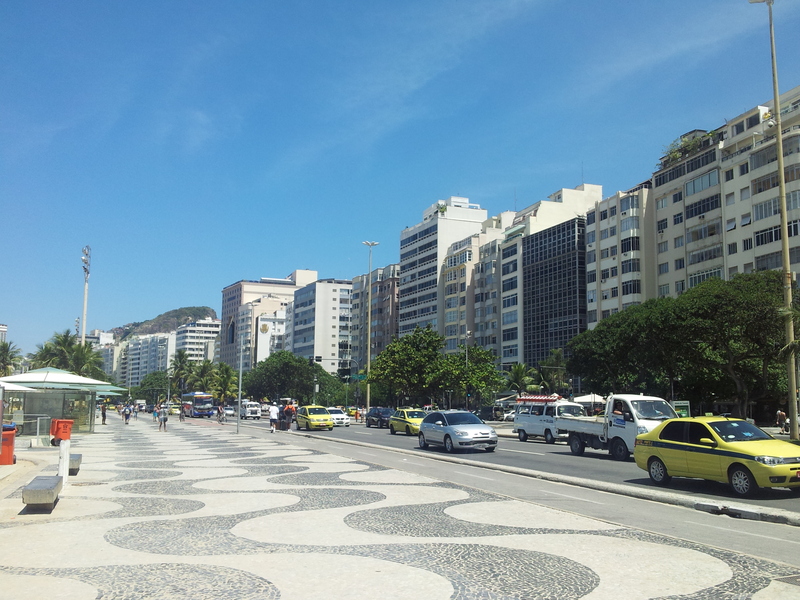 Rio is a fabulous city! We visited many years ago when we did a sweep through Brazil. Stayed at the Copacabana Palace (before it was renovated) – so atmospheric. Loved all the sights you mention, though we missed the Selaron Steps. They look quite interesting! And as we’re not huge sports fans, we didn’t take in a football game. Thanks for a trip down memory lane :-). 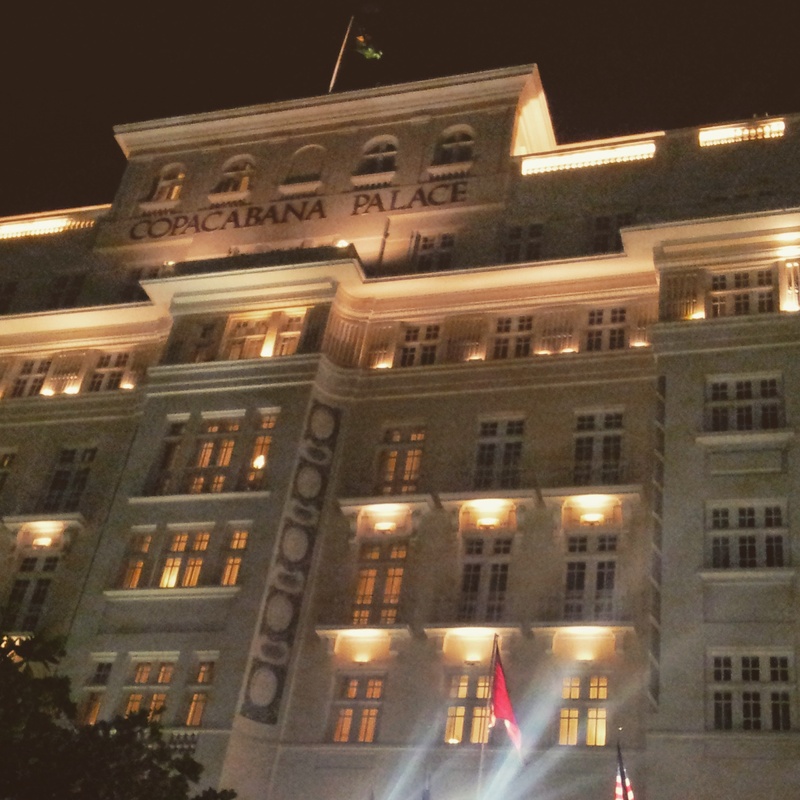 Wow staying at the Copacabana Palace must have been quite an experience – we had a wander around inside & it really had a touch of class about it! So glad to hear you liked Rio just as much as I did. I’m not the hugest sports fan either but my hubby’s a different story Definitely recommend a stop at the Selaron steps if you ever return! Thanks so much for reading! 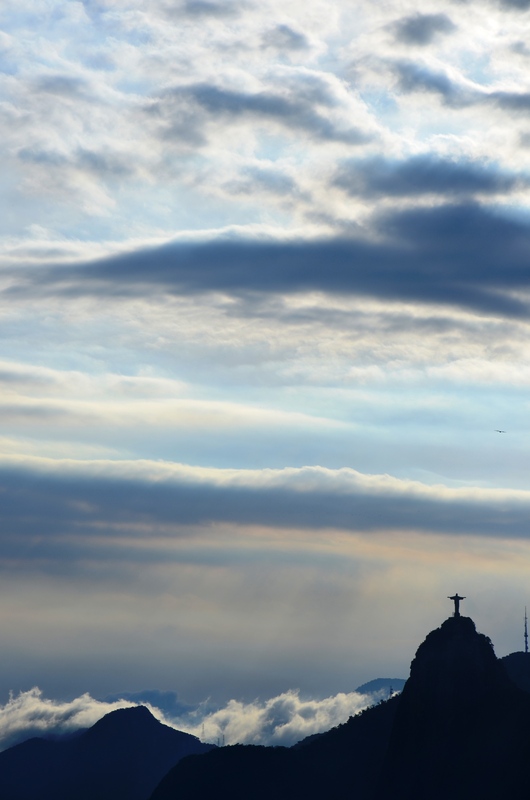 These are some really amazing photos, I really like the angle on the Christ the Redeemer statue from beneath. Latin America is high on my list of places to go but I don’t think I will make it there until I move back to Canada. I’d never heard of those steps, I think the color alone would make it one of my favorite things to see there! Thank you Melissa! I know what you mean about visiting it – it really is so far from here in London so I’d have liked to have spent a bit longer out there but with work and travel time etc, we still managed to get about a fortnight out there 🙂 The Selaron steps are fabulous – so full of creativity and bright colours – just fascinating to see how he transformed this ordinary staircase into such a work of art!